Bryan O’Keefe of Billerica, MA has been named the Athlete of the Month for June 2018. 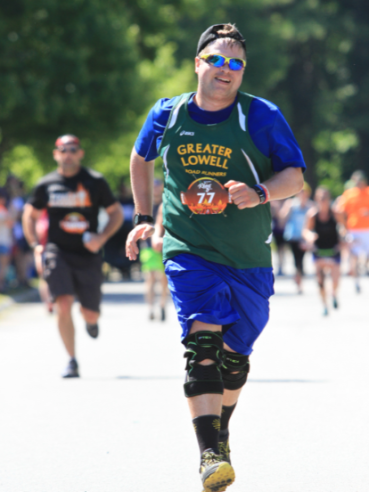 You may not know his name but if you’ve been to a Millennium Running race in the past year, there’s a good chance you’ve seen Bryan making his way to the finish line sporting his Greater Lowell Road Runner’s singlet! Bryan is not the first person to cross the line, but over the last 12 months he has gotten significantly faster. Simply compare his Immediate Care RibFest 5 Miler times. In 2017, Bryan crossed the line in 1:13:46 (14:46/mile). This year, Bryan took almost 20 minutes off his time to finish in 55:35 (11:08/mile). Even more impressive, Bryan ran a faster pace per mile for the 5 Miler than he did for the Members First Credit Union Cinco de Miles 5k! He’s been working hard this past month! These statistics help to show just how much Bryan has improved over the last year. We are even starting to see him at mountain running events these days! The sky’s the limit for the guy that’s always rocking a smile and a thumb’s up! What makes Bryan the June Athlete of the Month isn’t just his dedication to a healthy lifestyle, but also his incredible attitude. Bryan shows grit, determination, and sportsmanship every time he toes the line. We are so excited to see where this running journey continues to take you Bryan! You deserve the fast times, you’ve worked hard for them! Good luck the rest of the year, we’ll be here to cheer you on!